Ah, June! Summer has arrived. Here in Los Angeles, the month is marked by perpetually gloomy skies, which thankfully shield us from the horrible temp-- oh wait, there goes the cloud cover and I'm melting into my Cintiq again. June is also a popular month for drawing challenges including KaiJune and JuneFae... but I didn't want to draw 30 of either of those things. 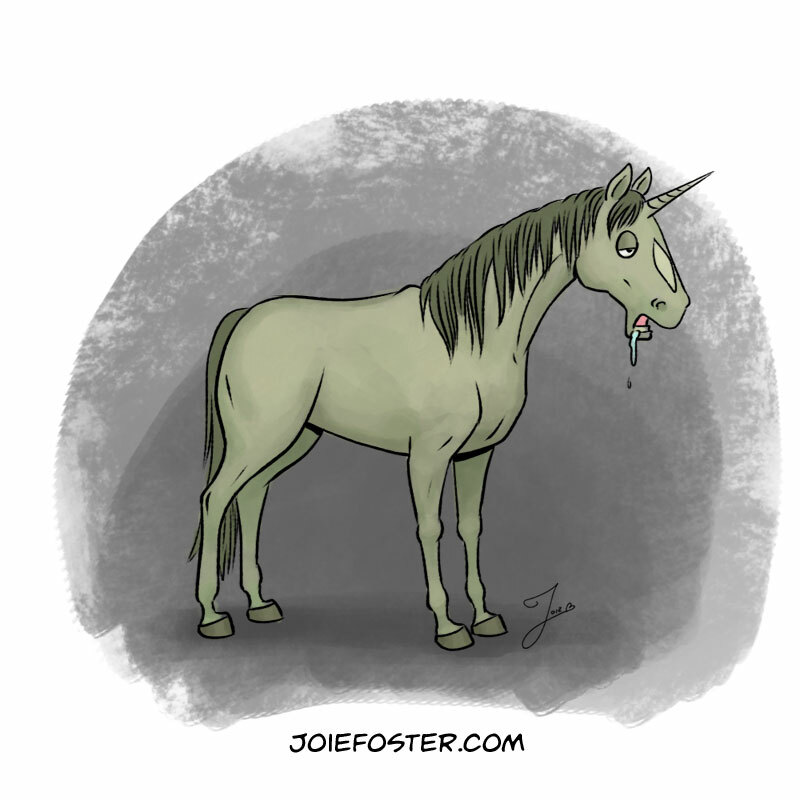 Instead I decided on something I loved: June + Unicorns = Juneicorns. Why? Because making portmanteaus are one of my favorite hobbies; I love to calembour* people to death. 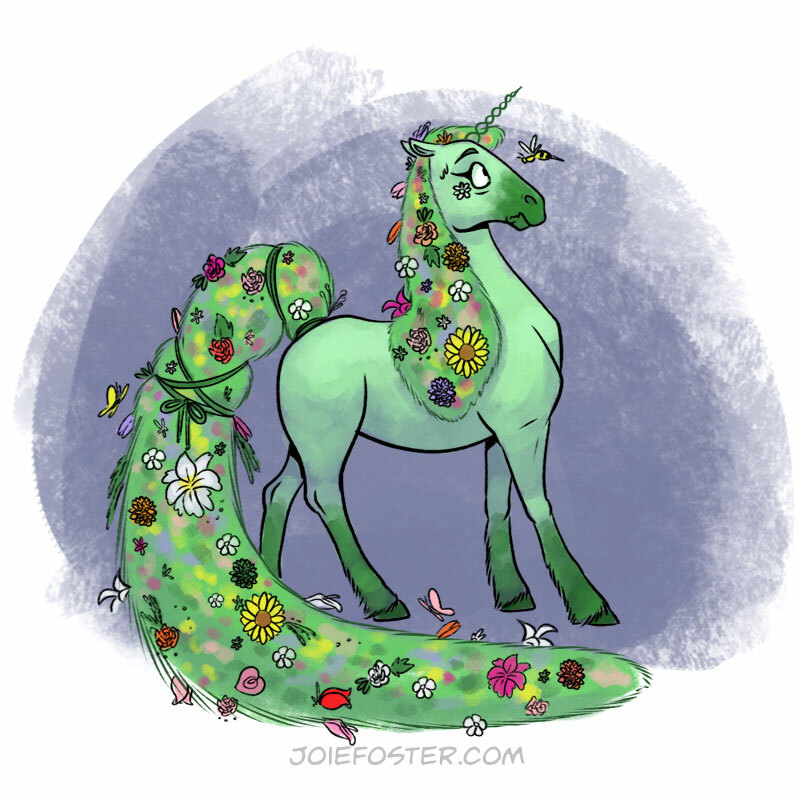 30 days of drawing anything is quite a wild ride, and the fun, daily challenge of thinking up a new magical horse led to some really fun jokes and visual gags. So without further ado, I present to you The Who's Who-nicorn. 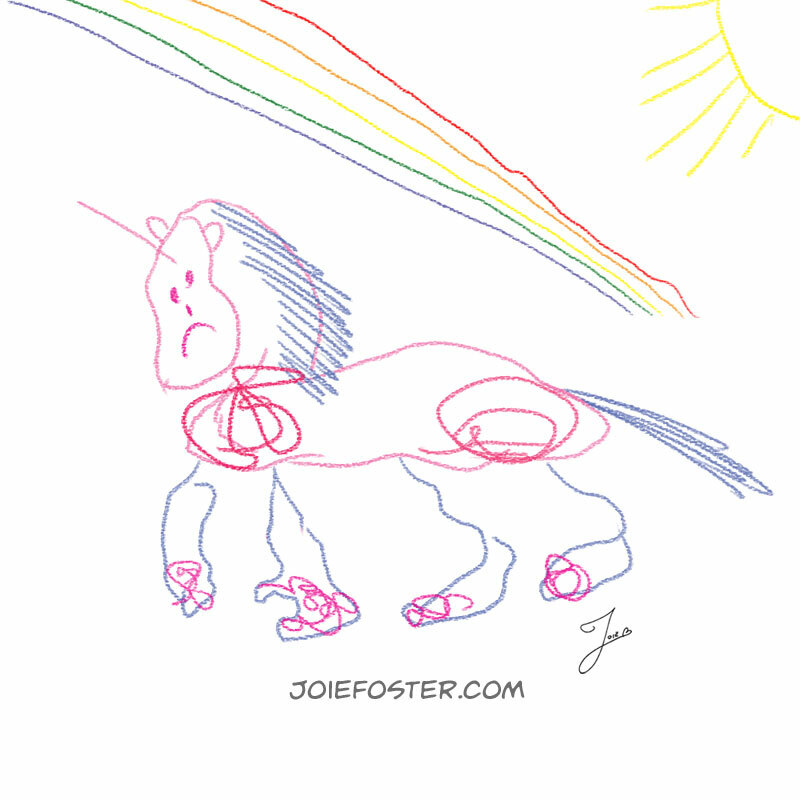 Here we have your standard model Unicorn. No frills, no upgrades, basic horn package (moderately pointy), and only produces glitter on weekends. She comes with four (4) hooves, an exhaust vent, and undercoating (while supplies last). This model, inexplicably, is equipped with a 2 horsepower engine. Prismacorn believes every hue of conspiracy theory. Once convinced that rain is actually the sky whizzing on the ground, she made it her personal mission to appear after storms to signal an end to the soiling. She is, unfortunately, very gullible. Her agent plastered her likeness on everything from nightlights to beach towels, and poor Prismacorn doesn't receive any royalties. It's probably for the best, as she'd spend her money on made up things, like Bitcoin. Did you do that? It wasn't me, I'd go outside or at least blame it on the dog! I think someone's eating egg salad. No, you're just smelling the pungent Mephiticorn. 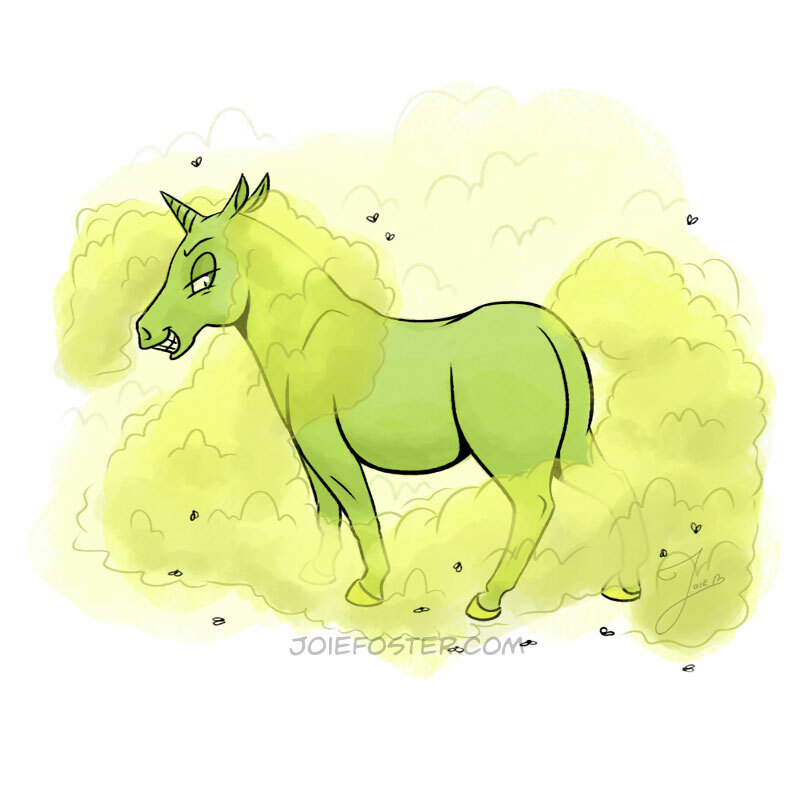 This olfactory equine typically wafts about swamps, low-tide marks, and Port-a-Dooties. It is colloquially known as a "Shartland Pony." The Infernicorn's fiery passion is so intense, she burns with an inner flame. And an outer flame. The whole lot is on fire, actually. The energy she expends could power a small city, though that same small city would likely have trouble fueling the 100% refined-sugar diet that sustains her. Normally found in hot & dry areas, she must be kept away from the gassy Mephiticorn at all costs. The Bufficorn is a real stallion at the gym, a workhorse that'll plow through the most difficult workout with barely a whinny. Having never been broken, he prefers to break records. 2,000+ lb bench reps, free-roam weights and a hundred inverted horn squats every day before grains. Sugar treat? Ha! Cubes are for colts. With a silky mane and perfect teeth, the Galeicorn is the most Instagram-famous of the unicorn world. Her legendary beauty is most often on display in photo shoots across mountain ranges and off the rugged Pacific Coast. While she can tame the winds with her magic, her hair is a little less submissive. Nine times out of ten, the photos end up looking something like this. What the Corgicorn lacks in height, it makes up for in personality. This petite pony is found in ancient forests and glades. If you come across a gleaming sword set in a stone, odds are it'll be guarded by this furrocious guardian demanding treats for passage. It has been known to serve as a steed for the fairy kingdoms, giving rise to its colloquial name, Horse Bus. Some people believe the Schrödicörn exists. Some don't. They're both right. And wrong. The first nocturnal unicorn on the list, Thrashicorn lives so deep in mosh pits that no light can reach her. Powered by face-melting rock that would make your deaf grandma go even deafer, she bucks societal norms and isn't afraid to let her inner mustang run free. Although her number one band is Equineox, she also attends every Powerhööf and Caine's Mane concert too. While not existing in a traditional way, the quantum nature of the Rezzicorn has been the subject of intense debate amongst horse-loving nerds. The magic of manipulating qubits allows it to crunch datasets that are staggering to behold. Considered the most powerful “computer” in the world, it’s a pretty cushy superposition to be in. The Puddlecorn always gets his recommended eight glasses of water a day. While he can navigate oceans, rivers and bathtubs with ease, dry land is more difficult than a world-record breaking butterfly stroke... against the current... in quicksand. Since his last party invite ended with soaking pergo, he's developed a bit of a 'wet blanket' personality. Known to be meticulously orderly, the Cornicorn lives in perfect rows. Every autumn, in a most odd ritual, the herd is known to form a maze for the enjoyment of very young or very intoxicated humans. Their magic, as is self-evident, is omniscience. Unfortunately, due to the ridiculous nature of its face ornamentation, no one takes their foresight seriously and that's how we end up with things like Crystal Pepsi and the Zune. The Scribblecorn, much like DMV workers, live by a saying: "Existence is pain." The Goudacorn is a rare specimen made entirely of an extremely delicious, unidentifiable type of cheese. Often pursued by those who think plain crackers are an abomination, his distinct scent makes it impossible to hide (especially if he's been sitting in the sun). Because his magic is self-regenerative, these nibblers are more annoying than anything. He makes an appetizing pair with his best friends, the Vinocorns. You can quit with the cheesy jokes, he's heard them all. The Arcticorn often makes her intentions crystal clear but can sometimes feel dismissive, to the point of giving one the cold shoulder. She is a decorative staple at fancy winter dinner parties, although her attempts at fame and envy are a bit transparent. While very cool to her friends, they know that she can turn downright frigid if anyone dares touch the thermostat. Put on a sweater, she's not heating the neighborhood! Lasers, glow bands, and fast cars, oh my! The Synthicorn, existing within the throbbing electronic beats of 80's sci-fi and horror inspired synth tracks, always moves with rhythm. She is best viewed at night; using her nostalgia magic to envelop your ears in pulse pounding power! A living fractal, the Metacorn is one of the most fascinating and difficult unicorns to define. Technically named z=z^K+c (where c = number of horns, K= lollipops, and z = general horsitude ), it's impossible to tell where it begins, where it ends, when the psychedelics kicked in, and what the color of my shirt smells like. Coming in at a perfect 5/10, the Plainicorn’s hobbies include: counting his blinks, organizing his artisanal sock drawer, writing complaint letters about crunchy taco shells being too loud (but never sending them), and holding an unwavering belief that mayonnaise is just a tad too spicy. His powers are rarely used, as that would make people notice him. With a long neck and top-notch health insurance, the Giraffeicorn is a chiropractor’s dream. Don't bother inviting her to your birthday party. Even if she could fit through the front door, she'd be terrible at limbo. Also, she can't read. You wasted an invitation. The Arabesquicorn seems to defy the laws of physics and gravity, executing some of the most beautiful and graceful dance steps known to horsedom. She is single-minded in her strides toward elegance and beauty-- which can be a bit distracting when she pirouettes into a display of oranges in the store. We're just tryinga buy our groceries, lady. Caberneigh and Chardonneigh are a power couple in the horse world. These celebrity Vinocorns are known for their outlandish parties, animated stories and confident dance moves. Though they've been known to be a headache at times, friends rarely stay mad at such an uncorked duo. Too young to partake in her parents' bacchanalian fêtes , Roséneigh is training to be a world class host. She often throws elaborate tea parties with artisanal sugar-cube tasting (where her great aunt Vodkacorn will try to sell you ugly glass bracelets, but you're under no pressure to buy them... go AWAY Phyllis, you're embarrassing me in front of the other foals). Heliocorn and Lunacorn are arguably the most important unicorns in their entire friend group. Their top five magical powers include being beautiful, being fit, being super-low body fat, and being better (than you, mainly). They also can't count. These two are frequently spotted with their frenemy, Galeicorn (friend when she stands on their rugged, wind-swept side, enemy when she's on their 'never photograph me from this angle' side). Their workout routine is stringent: 8 Instagram posts, and at least 5 minutes of vlog. EVEN ON UGLY DAYS. Subscribe to their YouTube channel and hit that notification bell because next week, they're bringing ombre fetlocks into year 2049! Seriously. They can't count. Ah, ah, ah! 'Tis I, the Vampiricorn; terror of the night, nightmare of the villagers, adversary of the Red Cross blood drive. Be careful with those party invites, I am the guest who will never leave. Just one more episode of Breaking Bad and then I'll go, I promise... Oh. Oh no. You didn't tell me you invited Garlicorn. Stay back! We are NOT friends, Garl! Rounding out this horned herd, these power ponies, the magnificent Monoceros, these e-fine equine, is the one and only Holocorn! Resplendent in her glittering coat, holo-shimmer wings, and linear-holographic hair and hooves, this unicorn can cause severe eye damage if stared at while in direct sun. Technically an alicorn, she's all that and then some corn. Her feathers are coveted as the rare ingredient in indie nail polishes (and hunted by Lisa Frank nearly to extinction). Much like the Vampiricorn, once she's in your house, she'll never leave... but that's only because spilled glitter is permanent. 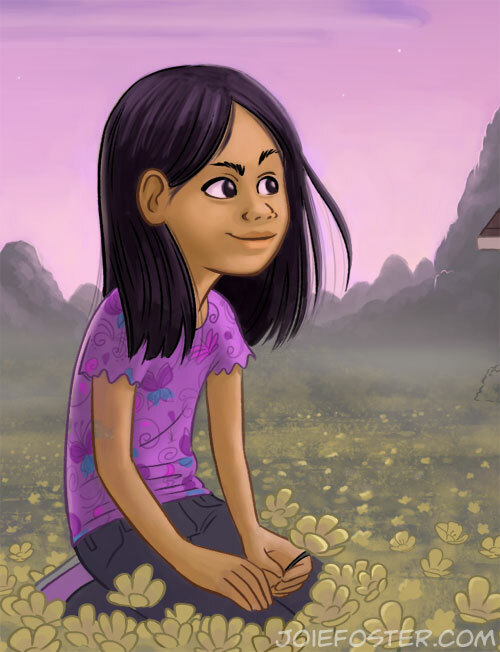 I've been working with Aspen Comics since late last year on an all-ages title called Mascots! The story is written by Vince Hernandez, penciled and inked by Joie Foster (ME, in case somehow you're lost and don't know whose blog you're on...), colored by Justice, lettered by Micah Myers, and edited by Gabe Carrasco. This sums is up rather nicely! A milipede villain (villipede?) 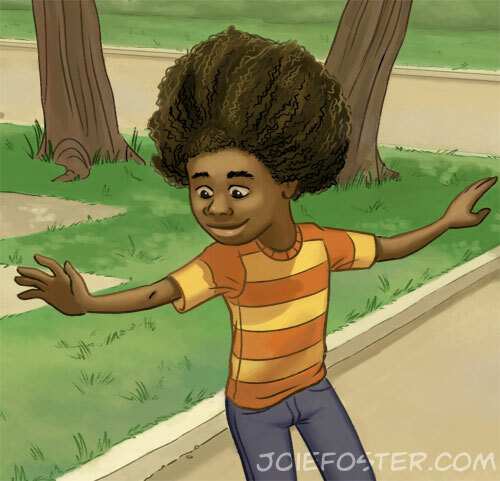 named Wormier must rescue his worm-y village by any means necessary, and builds a time machine to achieve his goals! And of course because it's time travel, nothing works the way he wants it to and he goes off on a zany adventure through time with his gryphon buddy, Griff. Yes, a gryphon named Griff. It's a thing. A ton of the mascots, creatures, and other critters from popular Aspen titles are involved, so be ready to get your cute-and-hilarious on! How do I buy the thing?? At your local comic book store in the back of any Aspen title that comes out this year! And... uh... turns out Chapter One came out in February, Chapter two in March, and Chapter Three this month... so I'm a bit late to the game in telling y'all about this. Whoops! At least that means you can binge read it? A gratuitous shot of my comp copies to make life easier for you... including Portal Bound which you should DEFINITELY check out since my buddy Gabe is a writer on it! Buy and then read all the things, and then tell me what you think. Be gentle, us artists are delicate beings. My my, it has been a hot minute since I've updated my blog! I'm alive I swear-- and not only that, I'll be physically standing at my booth in Anaheim this weekend, March 23-25 (2018, if you happen to be reading this in the future)! From Friday to Sunday I'll be present with fistfuls of my comics and art for your viewing and buying pleasure! I also have the honor of showing with my normal show-partner-in-crime, Ria from Ria Art World! Yay! You'll spot us immediately, since we're the booth with All The Cute Stuff (TM). Hope to see you there! Wow, I've been a little absent these last few weeks, haven't I? I have tons of blog posts planned, but have found myself a little, um... busy. I recently started a new in-studio job (the art test I had to do for it was referenced in my work-cation post, details to come later). So, in the meantime... Halloween has come and gone, and with it-- Halloween ComicFest! I'm super excited because that means not only do I have comp copies in my grubby little hands, but I can also share my pages with you! So without further ado, here they are! The Cover! By Simone Di Meo-- and perfection, b/c there's a Stranger Things 2 ad on the back! Two of the pages in action, with letters! So by now if you've been following my "adventures in food" series, you'll know that I can't shut up about Grand Central Market. It's weird, fun, hip (maybe a touch hipster), but also brings all walks of the community together. AND! The food! The food is amazing! It won't be any surprise then that this post is once again about something at GCM. Today's subject is the sleek, ultra fancy-looking PBJ.LA! I know what you're thinking, "Wait doesn't that look like (rhymes with fun-bust-ables)?" Sure, it may LOOK like that unnamed item from the freezer section that you ate as a kid (or as an adult, I don't judge), but the roundness and crimped edges is where the similarities end. When I first spied PBJ.LA, I was impressed with their exceptionally slick branding. Fancy logo, purple lights, and white, glossy walls-- it's the works. As a freelance artist, I understand how important branding is, and these. guys. NAILED. IT. So what do they have to eat? You guessed it-- peanut butter and jelly sammiches! But not just any regular ol' PBJs, these are made fresh from scratch with organic, non-GMO ingredients, and everything except for one item is plant-based. That one item is an optional add-on, and it's a buffalo smoked mozzarella (but there is a vegan cheese option!). Everything is pinched into a cheerful circle, and there's just something intensely satisfying about that to me. I had already eaten dinner when I approached their stall, so I went straight to the dessert option they had: the Chocolate Haze. It's a house-made chocolate hazelnut spread paired with dark cherry chianti jam. The bread was fluffy, and insides delightfully gooey. Look at the hazelnut yums seeping through! Instead of the sugar explosion I was expecting (as a lover of Nutella), I was pleasantly surprised to find that their hazelnut spread didn't scream of sweetness. My taste-expedition was complicated, deep, and very flavorful. It included a slightly bitter note of cocoa, the hum of hazelnut, and a mild sweetness from the jam. I'm not sure what I was expecting, but this round sandwich knocked my socks off! I immediately wanted to try everything on the menu, but sadly didn't have enough room in my stomach. And of course, when you eat PBJ, what do you also want? Milk! I can't have regular cow's milk anymore, so I was in luck... their other major offering is an Almond Milk bar. They have Vanilla Almond, Strawberry, Cafe au Lait, and of course the one I tried: Peruvian Cacao. The flavor of the milk was deep, rich, and chocolately-- but again without overwhelming sugar. It made me SO happy to drink. My experience there was super nice. I met two of the founders, Payvand and Jimmy, and they were open, honest, and really enthusiastic about talking to customers. I love their friendly manner and willingness to answer questions. I was of course concerned about what they do with the discarded crusts-- and it turns out they're developing another great product that will come with your sandwich so nothing is wasted! Creating the accompanying illustration to this post was a challenge, as bread is such a delicate subject to render. I wanted to reflect the bright purples of their logo (I don't get to use that marker much in food illustration), but didn't want the shadows to be so cool that they looked moldy. I also wanted to reflect how light and fluffy this bread was without over rendering it-- cue me testing different yellow and brown markers for an hour before I even started! Also, rendering their logo backward on the paper was a huge pain, but I feel like it added a great visual texture to the illustration. Anyway, I can't wait to visit GCM again so I can try some of their other sandwiches and almond milks. PBJ.LA, watch out, I'll be back! Are you a comic artist? Wanting to sell the artwork you create is a pretty natural step, especially if you're signed up to do an Artist Alley at a convention. But how to get your work out there? One fun DIY approach is to create what's known as an ashcan comic! This guide is by no means exhaustive, but I'm covering the basics and have links for further information at the bottom! 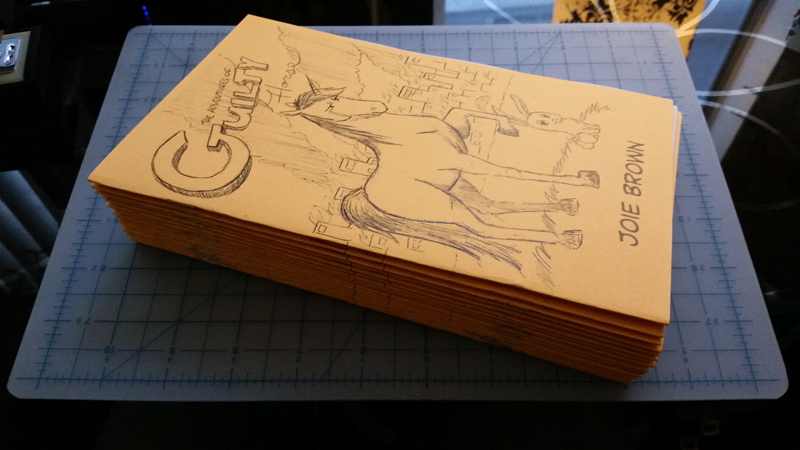 Guilty Horse, an ashcan I created out of a personal challenge to draw an entire comic in ballpoint pen only. According to Wikipedia, the roots of ashcan comics lie in creating quick prints used solely for copyrights that weren't intended for distribution (eg, "goes straight to the incinerator"). Also known as "zines," nowadays they are essentially mini comics, typically measuring 8.5" x 5.5". This is the most useful for doing small print runs, creating a collectible, or especially when an artist doesn't have a ton of printing money. While I have seen them come in several different sizes, professionally printed, or even full color, traditionally they are black and white and stapled (lovingly) by hand. Their subject matter can vary wildly, up to and including non-comic ashcans with more illustrative or abstract approaches. I've even seen small prose books done this way! Illustrators, this applies to you too-- this method can also be used to create an artist sketchbook. 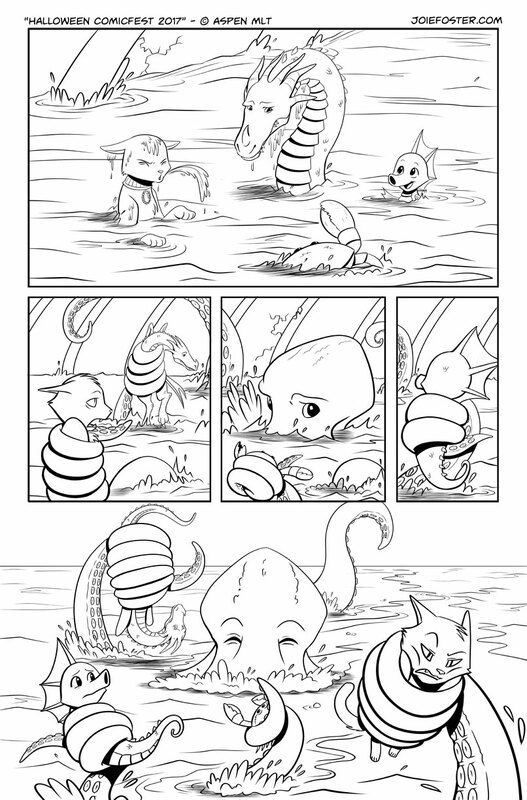 A fine example of an ashcan, Precipice, by Mom Comics! Check out the rest of her amazing work here! Basically you can do whatever you want. Don't let anyone tell you how to live your life! I WON'T BE A PART OF YOUR SYSTE--. Ahem. Back to the topic at hand. When you're done drawing, scanning, and otherwise creating your artwork, you've got to prep the files for printing. 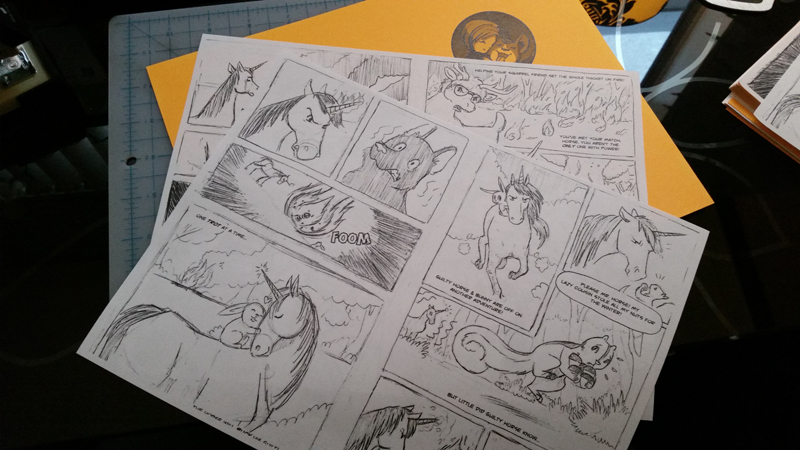 A nice perk of an ashcan is that you can print four pages per US standard 8.5" x 11" paper sheet. This means two comic pages per side, printed on both sides. The less actual pieces of paper you have to print on, the lower your costs! If you have a nice enough printer and paper at home, you can print your book right from your desk... but if that isn't possible for one reason or another, local printers (or places like Staples or Kinkos) tend to only charge around $0.10 per side of B&W printing. So the first two pages "12 & 1 and 2 & 11" are printed on the same sheet of paper flipped on the "short edge." This means that when the printer is finished printing page "12 & 1," it flips the paper over on the short side and prints "2 & 11" on the back. That makes sure that both pages are facing the same way, and that it'll all make sense when stacked together. This entire print job is only four pieces of paper! -Make sure your files are at least 300 DPI, or your linework will be all fuzzy! -Keep important parts of artwork and text away from the edges of your pages or they might get cut off on accident. A general rule of thumb is to leave at least 1/4" gutters all around (and in the middle where you'll be stapling, too! ), and have your text even further in, just in case. See you on the "flip side." Haha, printing jokes. If you have the budget, one fun thing I like to do is get my cover printed separately on colored cardstock. Preferably neon, so it stands out! It also gives the ashcan a higher quality and durability. I asked the FedEx dude for "the most retina burning cardstock they had." Now that you're all printed up, hopefully your pages make sense when stacked in order. When I want to make sure I've done it right, I pinch it gently in the middle and thumb through it to make sure. Gently bend the pages in half to "score" the edges-- basically you're marking where you'll put your permanent fold later on. If you want a neater line, or if you have a ton of pages, you can also do a light indent with an x-acto blade. Slightly scored papers gives you a good target for where to aim your staples! You're gonna need a longarm stapler to get all the way to the center of the pages without bending them. If you don't have one, a friend (or your local library) might have one you can borrow. If you think you'll be doing a lot of these, I bought mine for $20 on Amazon (this is an affiliate link, if you buy the thing, I get a kickback. Yay!) Two staples ought to do ya! Now we'll make your final fold-- use a flat edge to get it nice and crisp. I'm using a paddle used in applying screen tones, (another affiliate link!) but you could also use a butter knife or ruler. I just like the beveled edges of the tone paddle, as it won't put hard marks on the paper edges. If you have lots of pages, you may notice that the edges of your papers begin to jut out. Not to fear though, this is fixable. You can use an X-acto to trim the extra paper off, and it'll boost the craftsmanship and quality of your book. Aren't you glad you didn't put your artwork too close to the edge, now? So that's that! With a bit of trial and error, soon your artist alley table will have an entire library of your comics. If you have made an ashcan, please feel free to show it to me in the comments below! I'd love to see it. Hey guys, did you know I release a weekly newsletter? Did you also know that I offer fun and exclusive stuff to my subscribers? 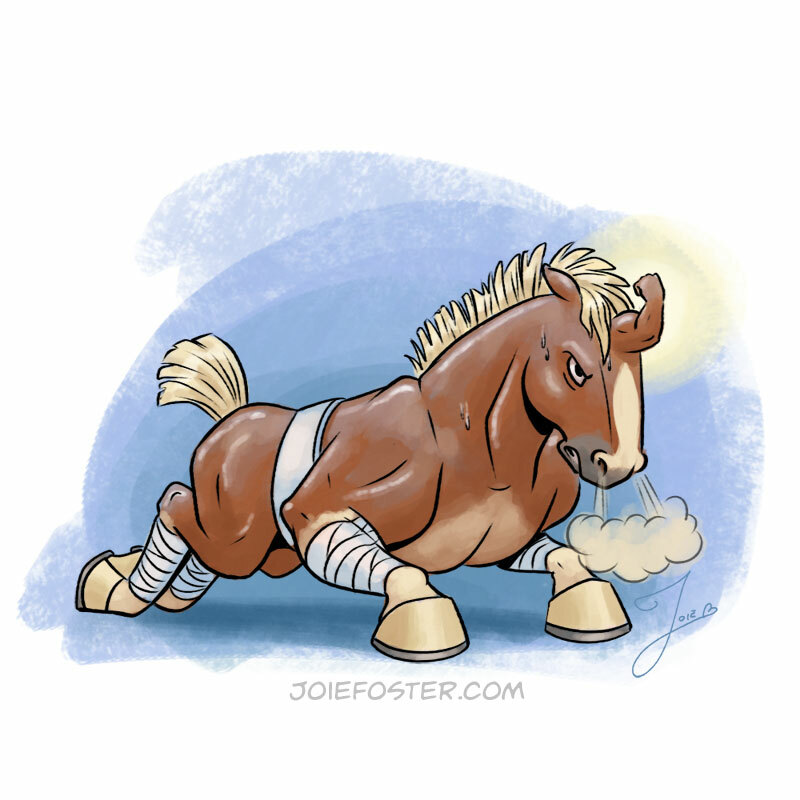 Today's newsletter has a link to read and download Guilty Horse, so make sure you sign up so you won't miss more fun stuff like this! I promise I won't spam you... unless you count A+ puns to be spam. A weekly newsletter about all the shenanigans I get up to, plus sneak peeks, early access to things, and exclusive offerings! I respect your privacy, no funny business here! Well besides my jokes. Those are funny. Don't you love it-- I tell you to start watching my Instagram Stories and them promptly stop updating both them and my blog, too? Fear not, I'm not dead! I went on a scheduled vacation up in rural Oregon where I didn't have much in the way of cell service or internet. Actually, it ended up turning into a roller coaster of a work-cation, but that's a story for another day. I may have had to work, but at least this was my surrounding scenery! But I'm back. Huzzah! Half a day was spent fighting through my extremely backed up inbox, but I'm now back at work, back at Instagram Stories, and of course, back to the blog. These guys are the best. Seriously, they've got a lil' something for everyone! I'm really excited to share both a review and an interview about my comic series Heavenly Kibble Guardian Corgi from the one and only Grand Geek Gathering podcast! "The Grand Geek Gathering is a multimedia network dedicated to celebrating the geeky things we love that make us who we are. Every Gatherer has different interests, passions, and traditions. We love that. As you get to know us on the Gathering podcast, we do not hesitate to share those passions and interests (or shove it down your throat)." They also have do videos, livestreams, and a slew of other things. I was really pleased and humbled to be the subject of both episodes 66 and 67 of their show "IndiComix." Episode 67 is a fantastic in-depth, round table review of all three issues of Guardian Corgi! Tyler and Jeff covered their thoughts on my writing, jokes (they lived through the puns, hah! 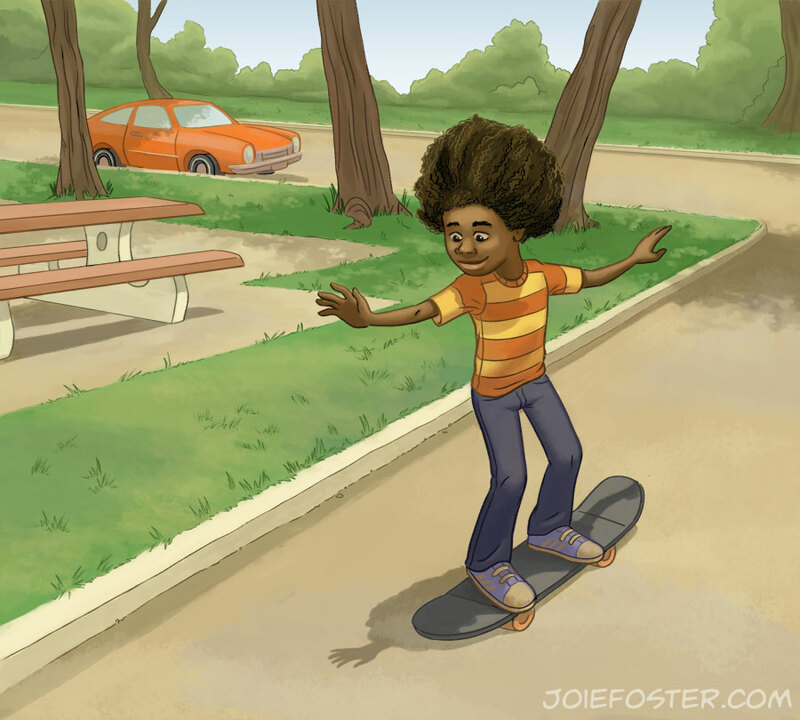 ), art style, character design, and the colors. They had delightfully nice things to say, including that they felt the fun, bright colors, and simplicity of the series made it very accessible and a different voice in the current indie comics industry. I was extremely pleased to hear that, as I aim to make my stories a fun experience for anyone-- comics fans or not! Thank you for all the kind words, GGG! Do you follow me on Instagram? Yes? Hooray, thank you! I hope you enjoy my posts there. I like posting in-progress shots of my work, pictures of me at conventions, and pics with my art buddies. There's more that you might be missing! Instagram has a cool feature I've been playing with called "Stories." Much like the famed Snapchat, Stories lets me build a little fun narrative. They're usually snapshots or tiny videos of what I get up to throughout the day that give you an extra special behind-the-scenes peek. You can get quality humor like this! And amusing, melting self portraits like this! And don't forget great snaps of my Studio Assistant! ... and weird closeups of the tips of my markers! Here's how to see 'em! So if you're on board, head to your Instagram app and check the top of your feed! There's a horizontal row of profile pictures with a little sunset-gradient circle around them. Those are all the people you follow whose Stories you might be missing! Alternatively, you can go to my profile and click on my pic (as seen above). Hope you enjoy, and maybe it'll inspire you to try it for yourself, too! See ya there.